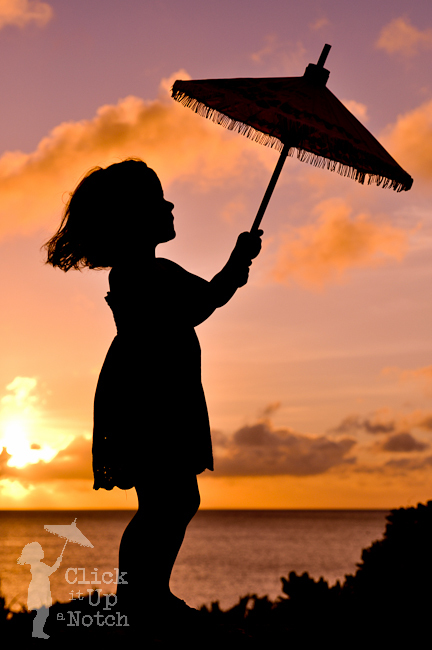 I realized after I posted my picture in the Top 10 of 2010 I have never explained why I picked that photo of Kate and her umbrella as my logo. I was taking a photography workshop and I needed to get a silhouette shot for my assignment. I asked Ian and the girls to go out with me that night and I had visions in my head of these amazing silhouettes I was going to achieve. Big mistake! We went to a local beach and the area where I thought would be perfect for the silhouette was not after all. After some frustration and fear the sun was going to set before I took a picture, I found a rock that was about 1 ft x 1 ft. I had Kate stand up on it and asked her to hold the umbrella. Of course, when you give a 3 year old an umbrella they never hold it like you ask. I needed her to look in a certain direction while holding the umbrella. Let me just give you a heads up…that is nearly impossible. I was getting extremely frustrated and was on the verge of yelling at her (I didn’t say this story would make me sound like mom of the year) I kept telling her to hold the umbrella like this, hold the umbrella like this, hold the umbrella LIKE THIS!! Keep in mind the whole time Kate is trying to do what I asked her to. She just didn’t understand. I took about 150 pictures and I was convinced none of them turned out. In the car on the way back, I was so mad and told her she wasn’t going to get ice cream like we had hoped because she didn’t do a good job (I still feel terrible about that). After we got home, I found this one photo. That is it! Out of 150 I got this one. I loved it! But I started to think about how I had acted that night and was extremely embarrassed and frustrated with myself. I apologized to Ian for acting like a crazy woman. I thought he would brush it off and say “it’s fine” but then he said “Do you even like photography?” I was dumbfounded. Of course, I liked photography. He went on to explain how mad and frustrated I was during the whole photo shoot and he couldn’t understand how, if I liked it, did I act like that? I then tried to explain how I had high expectations of how I wanted my photo and I was frustrated it didn’t turn out the way I wanted. I then started to cry (this happens a lot :O) I explained that since I was a stay-at-home mom it was nice to have something I was good at. I liked that in my photography workshop I was praised for my work. I was told I was good at something other than something regarding my kids. Photography was for me! I do love to capture their childhood but the reason I love photography is because I had a way to express myself again. I liked being told I was good at something again. When you are in the work place you get praised for your work but who praises you at home? It’s not like Emma thanks me for changing her diaper or Kate praises me for spending 45 minutes making dinner. It was so nice to be good at something again. So after a lot of tears and explaining this to Ian he started to understand why I love photography. The next morning as soon as Kate woke up, I apologized for being short with her the night before and took her out for ice cream that afternoon. Every time I look at that photo it humbles me. I’m reminded that kids are just kids. I shouldn’t have crazy expectations for her to act a certain way. It also reminds me that it’s not about getting the perfect photo of my kids if we are miserable doing it. I now go into all our photo shoots with low expectations of capturing the perfect photo. I am a lot more laid back and I know we all have a lot more fun doing it. It’s no longer this painful thing we have to endure. It’s now an enjoyable way to spend some time together while capturing it with my camera. I tell you all this because several people have asked if I get frustrated with photography, if my kids always sit still, and I’m here to tell you, I nor my children are perfect. Thank you, you had me tearing up here! We all have our moments, but you are right, it’s nice to get praised for something! So, again, thank you for all the amazing work you do for all of us!! oh wow this totally could have been about me! it’s exactly how I feel about photography. I get like that too, sometimes I start crying when things aren’t how I imagined. Thanks for being so honest and helpful! It really does feel good to be validated once in a while for something other than being a mom. Well, I will tell you: you are a great mom! Your girls are blessed to have you and they will realize it some day. And thanks for sharing this story. awesome post, Courtney! I had an experience like yours (with my 2 year old) and I STILL feel guilty about that day. But that “one” shot that you got is AMAZING! 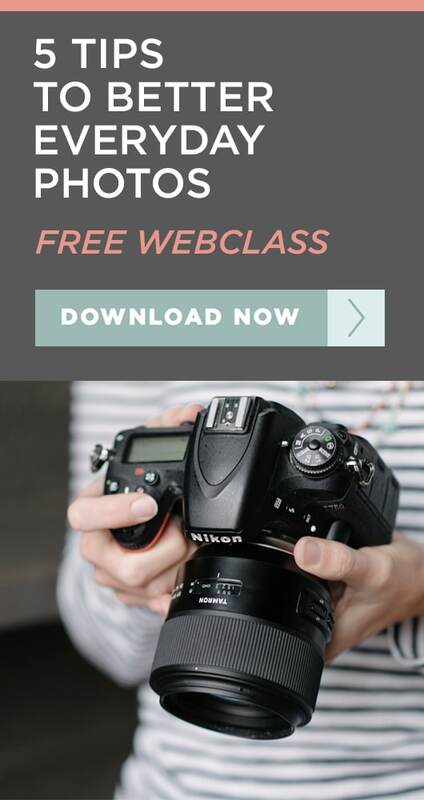 I found your website through a friend’s blog. I am your 100th follower! Love how to remember that kids are kids and that is why we love them, even if it is frustrating. Great post! We all have moments we regret in parenting. The trick is learning from them and trying not to make the same mistake again. I find myself apologizing to my children a lot. I think it is good for them to see that we are all human and make mistakes and it is a great example for them to hear us apologize for it later. Great job Mommy! Okay, this post just made me cry. Thanks, haha. You sound JUST LIKE ME!!! Photography is my outlet too. I love it. And I love that it gives me something just for me. Even though everything I photograph seemst to revolve around my kids, the images are just for me. I do get frustrated sometimes and end up camerazilla, but I too am working on that. It is hard to have a vision and not being able to achieve it. Thanks girl! Thank you for sharing this! I have been there with the frustration of trying to get the perfect picture. Hence one of my “resolutions” being to laugh more at the silly things… those are the moments I want to capture anyways! If I could count the times I have become frustrated with myself, Sam, and/or Bennett while photographing or cooking or getting ready or on and on and on…..and my son is only 9 months old. Thank you for your honesty. What a beautiful picture to have serve as an important reminder. God does that….He gives us those Ah-Ha moments that will forever be in our minds challenging us to be more Christ like in all we do. Wow. What a personal, special story. It’s nice to know that the girl who takes perfect pictures can get upset too! Thank you so much for sharing with us. Thank you for being so honest. I have had this happen several times with my 3 little ones and I also have to remind myself to stay calm. When I am calm, they are more likely to be calm too. Hey Courtney. All of your posts have been amazing to me. And all of the photos that you post are amazing as well. Thank you for being so honest. I too feel like moms don’t get their fair share of praise but it doesn’t stop us from loving our kids, even when we are frustrated. I have envisioned many photos that I have never been able to capture, but I aspire take photos like the ones you take. You’re a great mom and photographer. This too made me tear up a little…(sniff,sniff)… and it really hit home. Photographing my own kids is always so frustrating (for all of us:). I will definitely take your advice and go in with very low expectations next time and just try to enjoy it more! Great post!!! I laughed out loud when I read this because it was so familiar! I was a working mom until we got ready to PCS here and I had big expectations for how it would be to stay at home. It hasn’t turned out the way I expected so my expectations have changed. :) I, too, cry a lot when frustrated. And yesterday my husband had baby duty for a couple hours. He told me I should have thanked him. Ha! Who thanks me??? Hope you have a GREAT day!! I have to say thanks for posting this! Also I would have to say that not only are you good at photography, you are good at writing as well! Thanks again! Any tips on get g a natural face on my 13 year old daughter? Like a toddler she can’t seem to do a normal face – just a big cheesy grin! Trying to explain I don’t even want a smile but maybe just just a …. Can’t thnk of the word…. passive or neutral face? thank you for sharing this with the world. your honesty and vulnerability is rarely seen on blogs and I so appreciate you posting this. xoxo. My goodness, that is EXACTLY how it is for me. I have an “impressive” degree and worked for a Fortune 100 company doing work and being in an environment that I miss a great deal. When I decided to stay home with my children, well, I felt I lost my place in this world. (I love my children but motherhood is only a small part of “me”.) I’ve always enjoyed taking pictures, but when an acquaintance sold me her used DSLR at a ridiculously low price last fall, my picture taking rose to a new level. I am now incredibly passionate about it and , low and behold, people are telling me I’m good at it. Words I haven’t heard in a very, very long time. Maybe, just maybe I have a little bit of talent? But as the accolades are starting to become more frequent, and as my confidence increases, I have to constantly remind myself that the only opinion that truly matters is that of the One who will hopefully say “Well done my good and faithful servant”. Oh Callie, I teared up reading this post, too and teared up again when I read your last line. Yes, that’s all that matters, right? I’ve been meditating on that same thing…..
Ok you had me crying!!!!!!! This happened to me when i tried to get the kids Christmas photo this year. Olivia did not want to help hold Morgan in the picture she ended up crying and trowing a fit and it was not fun like I thought it was going to be. I pictured this great photo session with my kids and it was not even close to that!. I ending up yelling at Olivia and I called her a brat! Can you believe that, what a bad mother I am! I can relate to what you were feeling and this story. Thank you for sharring this. You are one lucky gal! Thanks for such a great and honest post. Thank you for sharing this – I’m glad I’m not the only one that has gotten overly frustrated at my child when they did nothing to deserve it all in the name of a ‘good shot’ – not my finest moments either… but what a BEAUTIFUL capture that is!! Courtney, I LOVE that story! When you said, ‘Photography was for me! I do love to capture their childhood but the reason I love photography is because I had a way to express myself again. I liked being told I was good at something again. When you are in the work place you get praised for your work but who praises you at home? It’s not like Emma thanks me for changing her diaper or Kate praises me for spending 45 minutes making dinner..’ I can TOTALLY relate. It’s so nice to have something that’s yours, that you feel provides an outlet for your creativity! You’re doing a ROCKIN’ job! Thank you! This is such a timely post, so thank you for sharing it again. We had an incident just today when I was trying to get just. one. good. photo. of the kids and they were not very cooperative. I wasn’t going for perfection, just everyone’s eyes open and no one making a goofy face. This is a great reminder that kids will be kids and no matter whether the photo is “perfect” or not, I, at least, captured the memory. Loved your honesty in this… thank you for sharing. LOVE LOVE LOVE this story! It is real and beautiful….and I LOVE the photograph. What a perfect shot. you are such a gem, courtney. can i just say that although CM workshops are God’s gift they also have a way of bringing out the stressed-force-of-nature-over-achiever in all of us first borns? ;) yikes. just finished my first one and learned a ton, especially what NoT to do next time trying to meet my timelines/goals/assignments. This is one of the most beautiful photos I have ever seen. You are so blessed to have this angelic photo of your daughter. Amazing! Thank you for this! You story has definitely humbled ME! If only all parents could read this… its awesome information. This info would save the child and parents a lot of tears. My parents were not gifted with parenting skills, lots of tears and frustration throughout my life. But I overcame and learn how to set the course of my future in a positive direction with GOD’s help. Bravo for this post, we can learn from it. Thank you!! I’m so glad to hear you overcame and learned to do better for your kids :O) Thanks for your kind words! I just found your blog today via Pinterest and I’ve been, and will continue, hanging out, trying to soak it all in. I’ve blogged for 3 years, all with a point n shoot. My husband was the photog buff and recently bought a nice Nikon D-something. See? I know next to nothing. My husband died totally unexpectedly on May 14 this year. Since he’d just purchased the Nikon I was going to return it and give the $ to our kids, but more then 7 days had passed so I was “stuck with it.” What an unexpected and delightful gift. Although I’m still using it on auto, I.am.in.love. I’m very excited to find your blog for that reason. For the cover photo (the only full color – it was 1993, ha!) I asked Marlon to shoot the pic of me, our 3 boys and our dog. In the park. Perfect, right? The boys were fighting, the dog was, well, a dog and I had a migraine. But I was on print deadline and this was waaay before digital. He snapped and snapped and we got one decent shot. I wasn’t pleased but I had no choice but to run with it. Now, the boys are all grown and I’m a gramma. My husband is gone but I still have a few issues of Step Parenting Today with that posed, forced photo that always reminds me how utterly crazy our life was then. But it was OUR life and OUR family. Sorry for the long post. But your story moved me and I needed to tell you why. I agree – Nobody’s Perfect, and yet, somehow it is ALL perfect. Maybe not in that moment, or the next. But looking back? I wouldn’t have changed a thing. I had tears running down my face after reading this! Thank you for sharing this with me!! My heart goes out to you for the loss of your husband. I love that you put your passion to work for you and created such an amazing magazine to help others!! That is fantastic! I love how you say it is “our life and our family”. That is so true!! Thank you for taking the time to leave such a wonderful comment! I came across this site via a Birth Photographer page on facebook. I love the honest, down to earth advice you give. There are no airs and graces, no ‘know-it-all’ attitude, you’re not afraid to say that you don’t know it all! I think so many SAHM can relate to your story with the logo! There have been many times I would get angry and frustrated with my kids (I, too, am a mother to three girls!) for that ‘perfect’ shot to put on my site. In the end, I always found that the natural, non posed shot was the one I’d end up using. My kids went through the phase of ‘Mummy, get that camera out of my face’ but now they’re a bit older, they quite like the photo shoots! If only I can get them to stop posing in that ridiculous way…..well, that’s a whole other blog. I love that you made this into your logo. What a great reminder to keep focused on what truly matters and be centered. :) Very inspiring. Bawling my eyes out. OMG. I get chocked up when I read it again. I can relate to this in so many ways! Thank you for sharing your story and for making me feel a little less alone and crazy! What a wonderful post! I thoroughly enjoyed reading it & truly appreciated your honesty. It was such a fantastic reminder . . . we all need an image like that to reflect on! Such an important thing to remember. I am very bad about judging other peoples photogrpahy and being disapointed that I can’t get the same look. I always try to remember that you never know how many pictures it took for them to get that one good shot or what maddness is going on behind the scenes that you don’t see. OH- I hardly EVER comment on posts- EVER- but this actually moved me to tears. I remember being there.where you were.and I could actually feel the guilt! :-( no, we are not perfect as parents, as humans period. we just have to make apologies for the mistakes that we have made, and attempt to learn from them. this post was wonderful! and while I still have a long way to go with phototgraphy, it makes me think twice about what the real meaning of life is…. BEST.POST.EVER…while I’m not a professional, I do always want to get a great shot, and get frustrated when it’s not going just right. This year, my goal is to enjoy more of the moment, and not worry so much about the “best” photo. I’ve come to realize that if I want something to sit still, I should probably focus on taking pictures of rocks! ;) Thanks for sharing with us that you are human!!! We all have moments like that. I can relate! The logo is wonderful and you are good as a photographer and mom! I loved reading this post! It reminds me of me photographing my kids! I to get so frustrated when they don’t hold still or fool around during a photoshoot. I am getting better with being more relaxed but it is still hard! Thanks for pointing out that we are not perfect and what really counts is the memories that we are capturing! NOBODY is perfect! So true! I loved hearing that I am not the only crazy photography mom. I’m glad you seen the stress you put on your child early on. I can’t even stand to watch videos (before I got into photography) I took of my kids when they were little. All I hear is move here, look there, do this, don’t do that. Although there are still times I have to remind myself to relax and enjoy the moment, I am much more aware of how I treat them and try not to have those unrealistic expectations. It will be what it will be and I try to get out from behind the camera to BE THERE to enjoy the moment with them. I do have to say…it is so much fun having a teenager for practice…when she wants to that is, lol! Courtney, I feel the same way! Friends have been asking me to take pictures for them and I don’t mind, but photography is like my little escape and secret. Not that I don’t want to share it, but it’s a place I can just be me….. tearing up for sure! Oh my, what a wonderful story and logo! Thank you for sharing! I just came across your website and saw your logo. I kept looking at it thinking it looked familiar. I read this post and saw the photo and remembered where I had seen it. I was in your class (was it natural light 101?). Great story and beautiful photo. Hey Kelley! Yes, what a small world! It was Natural Light 101. Too funny :) Welcome. This sums up why I got into photography so well (being a SAHM and married to a AF man myself). And pretty much recaps many of my forced upon my family photo shoots. Thanks for the reminder to enjoy it and enjoy kids being kids :-). Thank you for sharing! The photo is amazing. My son is 18 months and I have not tried to pose him yet- I have been taking more candid shots because he does not stay still for long. This is so nicely written. Perfect story telling and it makes me feel small. Incredible how much such a picture is moving you and honestly me too. And then you even choose to make it your logo. A reminder how humble we should be. This is great parenting, photography, story telling and a great lesson in general we all can learn of. You make me remember that we need to enjoy the moments and should not get frustrated when we have the feeling something doesn’t go the way as expected. Because it might actually be the best thing we do and we don’t even enjoy the moment. That exact moment we think everything is going wrong. A great lesson I try to keep close to me. When ever I get a moment like this I will hopefully not forget and share it with you. A great story and one with a lesson I’m familiar with. Although my children are all grown I have had to apologize, and on several occasions at that (Yeah, bad dad! ), for blowing up at them for not doing as I asked, showing up a few minutes late, etc. It wasn’t ice cream but I did end up treating everyone out a our favorite local restaurant. As someone who is in the middle of creating their own logo, I absolutely LOVE this. Can’t wait to read more of your site! Wow… that is definitely me. I have a shorter tolerance with my own kids. OMG! Thank you so much for posting this. That is so me and something I am always having to work on. I have learned that I am much better sticking to sports and plants/landscapes. They are beyond my control and I don’t fret as much. I still love photographing my kids, but not portraits. Maybe that is a skill I will one day learn, but for the control freak in me, the other stuff is more fun. Thank you for baking that real… My husband, also Ian, sometimes just does not get my passion and enthusiasm…. My two girls, love doing photoshoots…. But I’m often so busy trying to get the perfect shot that the moment passes me by. It’s just nice to know I’m not the only mom to get like that!!! Thanks! Thank you for sharing this! Although I’m not a stay at home mom I completely agree with how you feel about being told you are “good at something”. Thank you! I only take candids of the kids anymore. Once in awhile I’ll ask the family to line up for a group shot and I try not to do more than 2 or 3 shots. I may not be the best photographer, but I have improved thanks to classes, the internet and your 365 day challenge. I could have written this article myself word for word! I am so glad you started this site and that you published the thirty day challenge e book. It’s changed my life and I’m starting to feel confident about starting my own business after 7 years as a SAHM folllowed by 9 years in advertising! Thank you! P.S. I cry a lot too! It’s because we are passionate and creative people! What a great post Courtney. Yes, it is easy to get frustrated when trying to get the perfect shot. I love how you have shared this with the community. And you are right; no one is perfect and we can only strive to get better at the craft. Hi! Now that logo isn’t just an ordinary graphic art. It has life and a story. Who says a photographer has no “moments” of his own? Thanks for sharing your humbled story. God bless you! I always wonder about the story behind the “umbrella girl” – this is amazing! I’ve been there and done that, and still find myself (thankfully, only on very rare occasions) getting stressed because the photo isn’t unfolding exactly the way I want it to. For the most part, I’ve let all that go though. I try to focus more on “everyday” or “lifestyle” photography. Even when I’m trying to get a portrait and I’ve staged the scene, I still try to capture my kids “in their element” – I’ve found that saying “look at the camera and smile” comes across phony, whereas just letting them do whatever they’re going to do (which certainly means never looking anywhere near the camera, nor smiling!) is actually capturing THEM. And really, that’s what we want to preserve with our photography anyway, isn’t it? As the get older, they’ll be easier to direct (and bribe!) into doing more ideal, themed shoots. For now, I’ll just focus on capturing their “true” little selves. I found your blog just a few weeks a ago and bought your eblook a few days a ago I can’t get enough of your articles and your book. I’m. Grandmother and got my Dslr a couple a years ago. So I’m late to the party! I also took a course at the local college. But learning a whole lot more with your blog. I also get so frustrated because I only have the girls once a week and I want to “make up time” and take a zillion photos. Sometimes as they walk thru the door they said “no photos today” (they call me paparazzi Nana). Keep those blogs coming. I’m getting ready to re-read your book for the second time. Oh gosh this hits home! For me it is the juncture of art and technical skill and I get frustrated all the time! Add my adorable great nieces and my burgeoning skills and the frustration level is high high high!! Thanks for sharing your story! with your blog,I really appreciated your tips on photography.Being an amature,I have to take your advise and learn from them.Thankyou for sharing your honest experience and personal feelings.I was so frustrated too,when my pictures that I took did not come out good.Again thankyou. You can definitely get the WOW factor. With time, patience and your eagerness to continue to learn, I don’t doubt you will get there! Courtney – thank you for sharing this beautiful story so honestly with all of us. 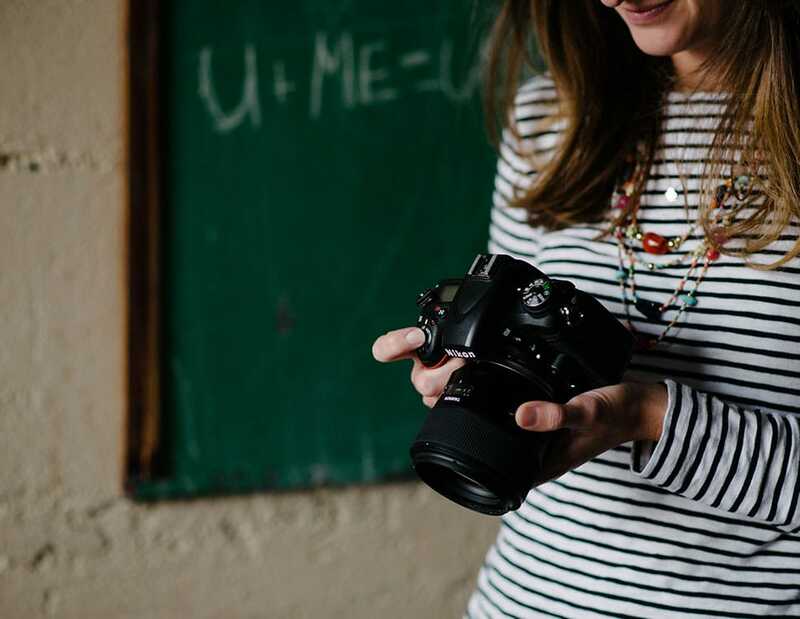 You are a source of great inspiration not only as a photographer, but as a mom and entrepreneur too! I remember meeting you at BlogHer a couple of years ago, and have been following your blog on and off (wow – how it’s grown!). Now that I’ve committed to doing the 365 project, I’ll be on here all the time :). And will keep reminding myself that it’s not about getting the perfect shot each time i pick up my camera, but about practicing and enjoying moments with my kids. Thank you for sharing your story, I am a Mom and Grandmother that loves taking photos and I too get frustrated at times..but I have learned to try and roll with the flow when it comes to taking photos of children. I am just a beginner even tho I have been taking pics for years..and when I take photos for people they love them, but I feel I can do better and I’m trying to improve myself. Thank you so much for sharing your stories and what you have learned, it is helping me!! I’ve learned with children to try and get the poses I want (or what parents want) does not usually work out well…so I get what I can and am usually running around snapping everything I can get..the parents usually get very frustrated because the kids aren’t listening and I have to tell them it’s ok, they are children and it’s better if you don’t force them otherwise we have melt downs. I shoot so many pics that there are bound to be some in there that will work. Thank you again!! Obrigado por ter compartilhado sua experiencia fotográfica, além disso, sua experiencia de mãe, é notável tamanha sensibilidade nas suas palavras, dai entende-se de longe porque optou por ser fotógrafa. Thank you for sharing that story. I too love photography because I feel like I can accomplish something that other people enjoy. My family and friends keep telling me I am a good photographer but I wish I could believe them. So I keep trying and I think I’m improving. And if my image’s don’t come out perfect, I can fix in photoshop, which helps my confidence a lot. But, I still strive for perfection. I’m hoping one day I can make some money with my photography. Wow! So humbling. I really appreciate you being vulnerable and sharing this story. I loved reading your story!! !